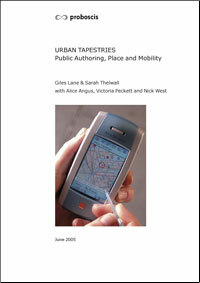 Ten years ago we published Public Authoring, Place and Mobility – a report on the Urban Tapestries project (2002-04) which brought together all that we had learned, described our methodologies and activities, evaluated our achievements and presented a series of policy proposals. I have been re-reading it to see how well our ideas have held up over the past decade, and to what extent they have been borne out by the development of social media, the mass adoption of smartphones and connected devices, and by social and cultural behaviours. Urban Tapestries was conceived in June 2002, just after we had completed another project, Private Reveries, Public Spaces (2001-02), which explored the social and cultural impact of the emerging mobile communications revolution. We started to imagine what the effects would be on how people inhabit urban space once the physical topography of the city could be overlaid with an invisible data landscape accessible via mobile devices. Such “location based services” were then only in their infancy (in places like Japan via DoCoMo’s i-mode service) and nearly all the academic and industry research projects of the time focused on their potential use as tourist guides. Urban Tapestries set out to imagine and investigate the everyday – how might people use them in everyday life: on the way to work or school, going to the supermarket, visiting the doctor, socialising or playing in a park. Funded through an unusual public/private mix, the project set out to peer into the future ten years or so ahead. We sought to articulate a vision that was grounded in actual social situations and cultural behaviours, and not just to rely on imagined scenarios and invented personas. The report contains a wealth of observations and insights gained from our iterative and participatory process. We combined paper prototyping with social engagement, user trials of functioning systems in public settings as well as numerous public workshops and events where we shared and discussed our ideas as the project progressed. Below are some of the policy proposals which we made back in 2005 along with some comments on how the ideas behind them fare in 2015. We followed UT with a 5 year programme of projects called Social Tapestries (2004-09), where we sought even further to embed our research in actual communities and situations. Through a series of discrete projects we explored our concepts of public authoring and social knowledge in ways that prefigured many of today’s familiar tropes : wearable sensors and citizen science, civic engagement and participation, big urban data and environmental mapping, hybrid digital/physical interfaces, robotics and hacking, to name a few. In these we sought extend and deepen the insights, working with real communities in actual places to explore what opportunities could become realities. Governments, researchers and businesses need to pay greater attention to the needs of actual people in real contexts and situations rather than relying on marketing scenarios and user profiles. Co-design and co-creation techniques along with iterative and agile development processes have become commonplace, especially through the concept of minimum viable product as a means of fast and iterative development of new products and services. Although not ubiquitous, they are far more likely to be present in the development of services that engage people, from the grassroots to industry, commerce and government. If this trend continues it bodes well for the role of the actual people in the design, testing and implementation processes of services intended for them. Telecom network operators need to recognise the desires of people to communicate (by voice or data) with each other irrespective of the company they purchase their service from. Its hard to think back to a time when mobile data was restricted to the network operators own “walled gardens”, but it was actually not so long ago. With recent changes to EU data roaming laws bringing down national barriers by 2018, a whole new wave of data mobility will be realised. ‘Net neutrality’ remains a contested standard though, as all kinds of network and service providers (not just mobile) increasingly converge their offers and seek to maximise revenues for high value content. There is a clear and pressing need for free public access to GIS data to make public authoring and a host of other useful geo-specific services possible. The growth of open mapping platforms like Openstreetmap as well as services like Google Maps and Google Earth made possible the rapid growth of user-created georeferenced projects and services in a short space of time. Yet the major owners of GIS data (such as Ordnance Survey) have only slowly and partially opened up their systems for free use by the public. The planned release of the UK’s entire LIDAR data in 2015 by Defra may be a signal moment in the shift from the proprietary model of mapping by the state towards a more democratic understanding of mapping a a civil process in its own right. Public authoring has the potential to be a powerful force in enriching the public domain through the sharing of information, knowledge and experiences by ordinary people about the places they live, work and play in. Social media has exploded into the public realm and has arguably taken a significant role in facilitating entirely new ways for people to share what they know and experience, as well as to organise all manner of movements for action and change. People’s willingness to share with unknown others underlines the essential human quality that seeks to build new relationships, new communities wherever we go. In counterpoint, the Snowden revelations have given weight to concerns about the extent of state surveillance that circulated since the late 1990s (cf the Echelon network) and the degree to which free speech is inevitably curtailed by self-censorship when people are aware that their every utterance and communication may be intercepted at will, now or in the future. Nevertheless, our abilities to form new communities around ideas, campaigns, issues and passions have been continually advanced by the depth and speed that these forms of social media have enabled. Public authoring could be employed to create new relationships of trust and engagement between public services and the people they serve. Public authoring proposes a reciprocity of engagement whereby public services would not just provide information but benefit directly from information contributed by citizens. Our ideal of new trusted, reciprocal engagement between citizens and public services has not quite emerged as we may have hoped, however there have been indications that such change is afoot, not least in the expanding area of open (public) data. That more public organisations are allowing others to access and use their data for their own purposes suggests hope for the future. There is much more that could be done to both increase transparency and to increase the role of citizens in the management of our communities. State surveillance is also a factor affecting people’s sense of agency and trust in governmental mechanisms that will have to be continually addressed as we shape the future of our democracies. The wealth of public data created by public authoring will provide many market opportunities for business people and entrepreneurs. The not-for-profit sector needs to embrace the energy and creativity this engenders as much as the commercial sector needs to embrace the need for people to be more than just consumers. The dividing lines between “public” and “private” have become ever more blurred in recent years. The impacts of austerities imposed since the 2008 banking collapse and subsequent ongoing economic turmoil have seen areas previously the preserve of the “public sector” outsourced to private enterprise under the guise of “efficiency” and profit. This was certainly not what we envisaged as it has imposed a narrow financial interpretation of value and excised almost all considerations other than the purely monetary from decision making. By transferring more and more of our public services in this way, the scope and legitimacy of democracy are undermined. We need to reaffirm other measures of value that have been pushed aside and stand firm for their re-adoption as standards to aim for so that we can indeed create diverse new opportunities in both “public” and “private” sectors. The technological imperative for defining a person’s position needs to be dropped in favour of an approach that incorporates the rich nature of the physical world’s location information – street signs, shop signage etc. Our insistence on not becoming entirely beholden to GPS, Glonass & Gallileo was perhaps a little brusque. However, there has also been a growing sense of discomfort with the purely digital. More and more people have become involved in making things: learning old manual skills that can be intertwined with newer digital ones. This hybrid digital/physical approach seems more and more plausible with each year. The drive to use the latest technologies and services must not exclude those who choose not to adopt them, or cannot, for whatever reason. As with recent critiques of the Smart City concept, our emphasis in the report rested on active citizenship being at the heart of the potential opportunities being offered by these mobile, location enabled services. This necessitates including everyone in benefiting from the opportunities offered, not just restricting access to those able to afford to pay. There has been much debate over the intervening years about access to the internet having become effectively a utility needing the same statutory regulation as access to fixed-line telephones. If a government wants to engage its citizens on a “digital-first” basis, it must make sure that there is provision for others not able, for any reason, to access via other means – setting a standard that other services can emulate or aspire to. These new forms of communicating will not appear overnight but will need careful cultivation and time to flower. To realise their fullest potential they will need more than just grass roots enthusiasm and activism. They will require regulatory nurturing and calculated risks on the part of business people. Whilst the integrated vision of UT as we imagined it has not yet come to fruition, the social media services which have flourished in the past 10 years have ended up straddling multiple spheres of life in surprising and unpredictable ways. Who would have foreseen the speed and depth to which services like Google Maps, Facebook and Twitter have penetrated into the daily lives of hundreds of millions of people, necessitating that government, education and business have all had to incorporate them into their standard procedures as well? What kinds of services and platforms will emerge over the next 10 years and how might we shape them beyond the rubrics and dictates of the marketplace? Looking back I’m immensely proud of the scope and scale of our vision as well as what we achieved both in the original Urban Tapestries project, and how we carried it forward into the Social Tapestries programme. A core strength was our insistence on a social and cultural focus for the project, not placing the emphasis on the technology. It identified that the heart of these systems and services is ultimately about connecting us, enabling us to communicate in new and different ways: building and maintaining relationships to each other, to places and the things we encounter in them. Our projects since have continued to explore these trajectories – enabling and encouraging people to have agency for themselves; to make and share their own stories, not simply to be cast in the role of the audience or consumer. Public Authoring remains a key concept that underpins our continuing work with communities as diverse as Pallion (Sunderland) and Reite (Papua New Guinea).